The rides for 2017 did NOT start with the Annual Polar Bear Run on January 1st. This is because we were in Tasmania on that day. We returned from Australia in mid-January to snow and rain. We being tanned and in short sleeves this was a bit of a shock. But we slowly acclimated ourselves and went back to work at our old part-time jobs. Our first ride this year is the Blarney Ride put on by the Oregon City Chapter of GWRRA (GoldWing Road Riders Assoc.) This is an annual food drive done for the Oregon City food bank. This chapter competes with the chapter from Salem (40 miles south) for the most weight of food brought in. Usually Kathy and I and 2 other members of our Vancouver chapter of the GWRRA also make the ride. But at the last minute Kathy was called in to work to replace another employee out sick. And she was very glad that they had called. The picture is a screen shot of my phone showing the radar for the area I rode through. 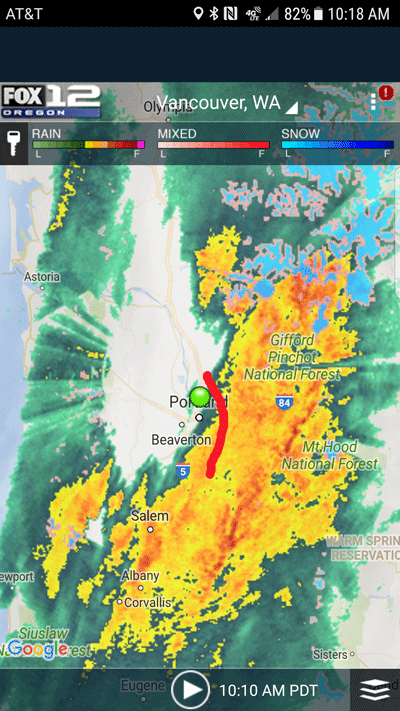 The red line is my route (about 30 miles) but the storm was farther to the left when I was in it. I didn’t think to do the screen shot until about an hour after arriving so the very wet weather was slowly leaving the area. The other two member of our chapter took their car, not the bikes. And when we got there only one bike was parked outside. This was the bike for the ride captain so that he could do the safety sweep at the end and make sure everyone had made it back. The chapter director and her husband were the only ones from Salem to arrive. They brought the car too but this is not unusual because they have to bring the food donations. But no other members or bikes came from Salem. 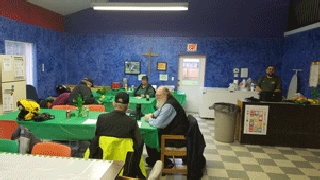 With the local members, the two from Salem and our three from Vancouver it made a grand total of 12 people! This is not one of the bigger rides in the area but this is an unusually empty room. So we talked a bit and with only two bikes and the downpour continuing it was decided to cancel the ride. 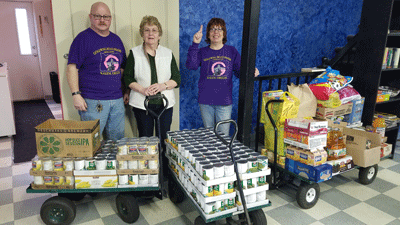 The food was weighed for each chapter and Salem won again with over 400 lbs. Vancouver brought just over 100 lbs., and Oregon City had about 300, for a total of 841 lbs. After the ride an “Irish Stew” is served (actually canned stew) with rolls and butter. As we didn’t ride, and it was too early to eat, this was also donated to the food bank. The 50/50 drawing was a whole $22, which I won and donated to the food bank. Along with other cash donations they ended up with a couple hundred dollars and nearly 900 lbs. of food. Not too bad for a dozen people! About halfway back to home I exited the heavy rain and actually saw some blue sky to my left. But the temperature had dropped and the road spray was still heavy so it was not a comfortable ride home either. I’m glad the run was canceled. The first Sunday in April is the Rose City Motorcycle Club’s Oregon 250. The weather is predicted to be partly cloudy and mild temperatures. That will be a great improvement. We are both prepaid for the ride as it is one we do often. The Oregon 500 is on the same page.